Often misdiagnosed as a wrist sprain. 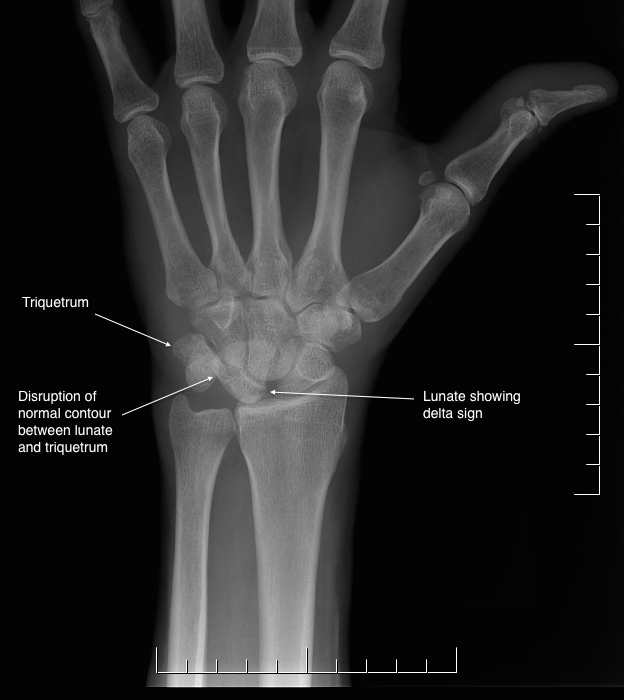 Sometimes the x-rays may look normal unless ‘stress x-rays’ are taken (making a fist). This will uniformly progress to a SLAC wrist after a decade or so if not treated. Symptoms are a dull ache in the wrist and / or giving way. Treatment of this if found acutely is operative. Delayed or chronic tear treatment is based. X-rays show the typical features including the ‘Terry Thomas” sign (widening between the lunate and scaphoid, but also a circle shaped outline in the scaphoid indicating that it has flexed, indicating separate motion to the lunate. However if the wrist is flexed in the x-ray you can see this sign also. 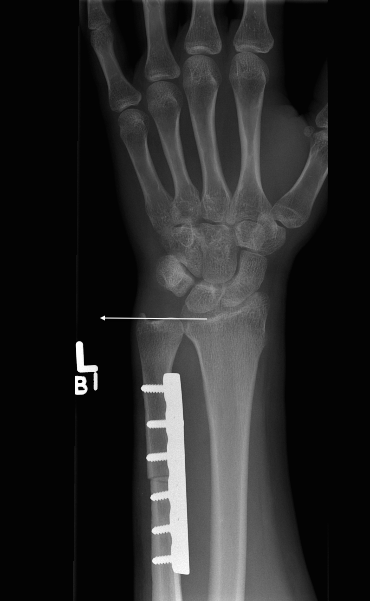 The lateral x-ray will show a DISI deformity as in a SNAC and SLAC wrist. These are less common than a SL tear but cause the same long term problems with loss of the normal kinematics of the wrist leading to arthritis. Presentation is similar to SL disruption with pain around the wrist, weakness and giving way. 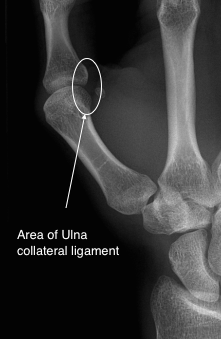 X-rays show the delta sign, where the lunate looks triangular (like the greek letter delta Δ), and loss of the normal arcs of gilula. 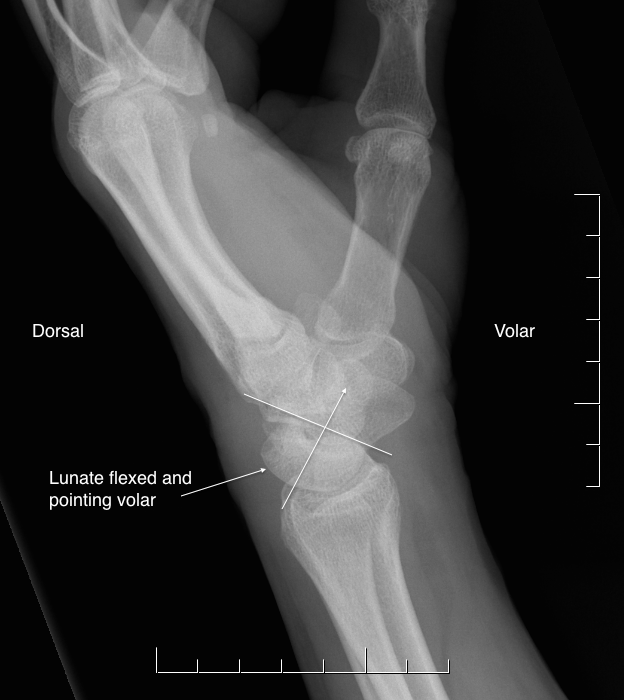 The lateral x-rays show that the lunate now faces volarly (towards the palm). This is called a VISI deformity, Volar Intercalated Segment Instability. Treatment is surgical stabilization. This encompasses two conditions commonly called skiier’s thumb when done acutely or game keepers thumb chronically. The thumb works as a post for the other fingers to grip against it. The UCL attaches on the inside of the thumb from the metacarpal to the proximal phalanx. If it is torn it is painful and unstable when the joint is loaded when pinching or gripping. The treatment of this is bracing to help let it heal. In refractory cases reconstruction of the ligament is required. The TFCC or Triangular Fibro-Cartilage Complex, is a structure responsible in part for the stability of the distal radius and ulna. It attaches around the ulnar aspect of the radius to the ulnar styloid. It is similar to the meniscus of the knee in many ways. It can be injured or be at high risk of injury because of anatomical variants as seen below in the x-rays. The ulna should be the same length as the radius. When it is too long it is termed ulna positive. 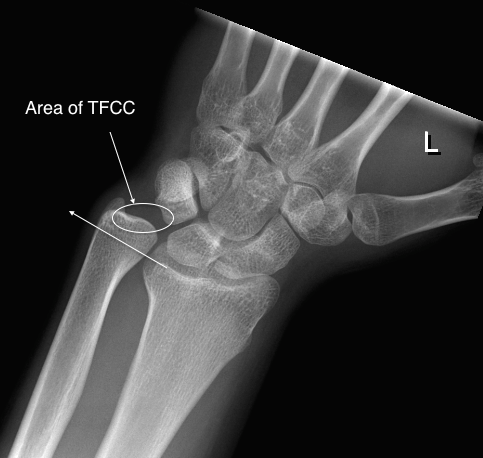 This makes the TFCC, which sits over the distal ulna more likely to be impinged on the wrist (carpal) bones. Treatment of TFCC injuries starts with non-operative management, splinting, steroids and anti-inflammatories. An MRI will help visualize the TFCC as it cannot be seen on an x-ray. The gold standard for diagnosis is arthroscopy, where a small camera is placed into the wrist and the TFCC is directly viewed. If there is ulna positive then an Ulna shortening osteotomy can be performed (removing the appropriate amount of bone), to bring the ulna back to the appropriate length. This procedure is tailored exactly to each patient to make sure the optimum amount of bone is removed for that individual. The TFCC can also be torn irrespective of the length of the TFCC. Here arthroscopic treatment can help.